Riverside Brewery & Restaurant is a Brewery, American (New), and Breakfast restaurant where most Menuism users came for a family meal, paid between $10 and $25, and tipped more than 18%. A Brewery chowhound from Richfield, WI tried it. A Brewery food lover from Chicago, IL tried it. 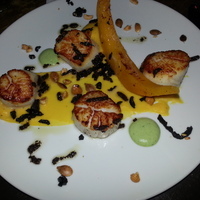 2 reviews of Riverside Brewery & Restaurant, first by cathyd. Went to Riverside Brewery & Restaurant with a couple of friends on a Sunday to try their brunch. We were seated in the lower level, which had a very nice view of the river. I was a bit apprehensive because when we got there (at 10:45), there was no one there. I thought, perhaps, this was a bad sign (as none of us had never been there before). But we were reassured by the hostess that we were just early and got there before the church crowd let out. She wasn’t kidding, as within 45 minutes, the lower level was packed! Our server was very attentive, filled our water glasses, and the food came out of the kitchen hot. There was no skimping on portion size either. I will have to go back to try other items on the menu. 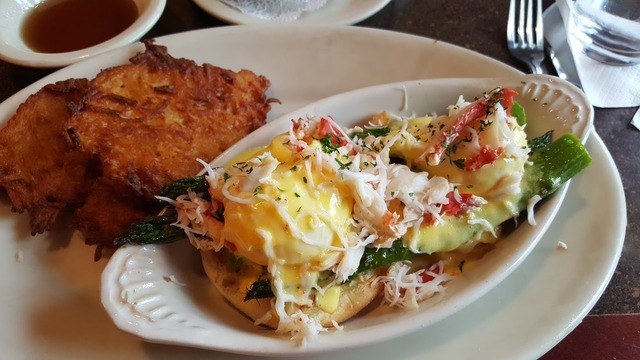 Eggs Oscar – Crab meat and asparagus topped with two poached eggs and hollandaise sauce on a toasted English muffin; served grapes and potato pancake. Eggs were perfect, light dish – very good! A gorgeous autumn afternoon is the perfect time to steal away for an early dinner at the Riverside Brewery. They have outside dining on the front (sidewalk bistro-style) and on their backyard deck which overlooks a meandering stream where you’ll always find several duck families with ducklings in tow. Easy parking (on street or lot across from the restaurant). The standard Fish Fry has 2 pieces of cod. They’re usually a good size, but I was hungry so I ordered the 4-piece. The portions were even bigger than I’d remembered. But so very tender, flaky and moist on the inside. Lightly battered and crispy on the outside. Delish!! My daughter and I shared a bottle of wine. She ordered the 2-piece fish fry and loved it. Comes with your choice of french fries, baked potato, garlic smashed potato or wild rice. Also includes coleslaw, rye bread and our homemade tartar sauce. OH!! Their homemade tartar sauce and Ranch dressing are awesome! These dishes from the Riverside Brewery & Restaurant menu are contributed by Menuism users directly, as part of a restaurant review, or as part of a photo upload. Do you own Riverside Brewery & Restaurant? Contact us to connect with your diners. People found this by searching for: Riverside Brewery And Restaurant, Riverside Brewery West Bend Menu, Riversidebrewery&Restaurant.Com, Riverside Brewery West Bend, Riverside Brewery Family Restaurant Menu, Riverside Brewery West Bend Wi, Riverside Brewery Wine Menu, Reviews Of Riverside Brewery And Restaurant West Bend, and Riverside Brewery Reviews.